﻿ TSL Technology Wireline Logging Tools and Development. Wireline conveyed pipe cutter - a safe downhole machine tool, no explosives or chemicals. A premium open-hole logging tool with variants for oil base and water base muds, used to acquire high quality electrical borehole images. Electronics accurately measures hundreds of channels with wide dynamic range. Precision transducers and software can place each pixel in 3D space thousands of metres below surface. 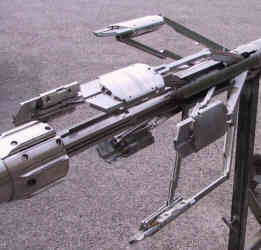 Photo by kind permission of Weatherford,	Inc.
For over twenty years TSL Technology's engineers have designed and manufactured open hole and cased hole logging tools. We have introduced innovative tool designs now imitated around the industry. Special projects include rotary steerable drilling and coiled tubing deployed tools. Tools are used by our customers to provide services. TSL Technology works with selected service companies so as to avoid any conflicts of interest in the technology and application of these tools. As a result we have become trusted and well integrated partners of leading companies in the logging industry. Tool development, field proving and full commercialisation can take several years. We work in secrecy - some of our largest projects do not appear on this web site. Many patents have been granted for these developments. TSL Technology is always willing to discuss technical problems requiring new tools and sensors. You may be surprised to find how often our broad experience will lead to a rapid appreciation of the requirement and a sensible proposed solution. If we know of an existing solution somewhere we'll happily point it out - our business is not re-invention. We have deep knowledge of resistivity measurement, fluid sensors and survey packages. Logging tools up to 25,000psi and 200C involve materials like Inconel, beryllium copper, titanium, ceramics and elastomers. 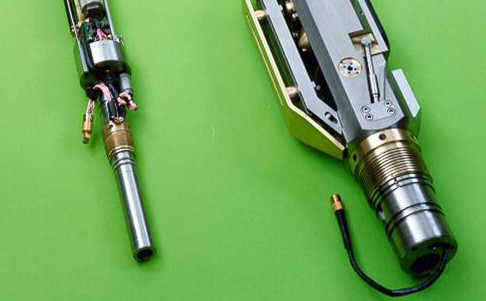 Special seals, connectors, mechanisms and actuators using custom motors and electronics add to the practical mix. Our ability to model tools and their environment at all levels of sophistication underpins development.